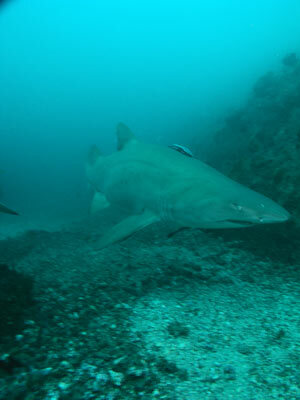 "There are only female and juvenile male grey nurse sharks at Magic Point"
Michael McFadyen's Scuba Diving - Fish Rock Shark Gutters The magnificient Fish Rock, located off Smoky Cape at South West Rocks near Kempsey, is famous for its 120 metre long cave that runs all the way through the rock. 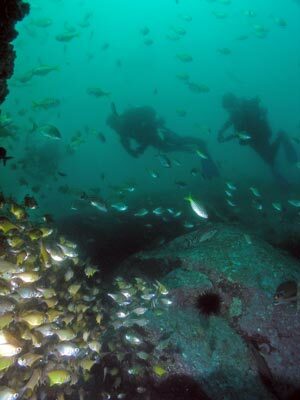 However, this is not the only dive to be found at Fish Rock, or even at South West Rocks. 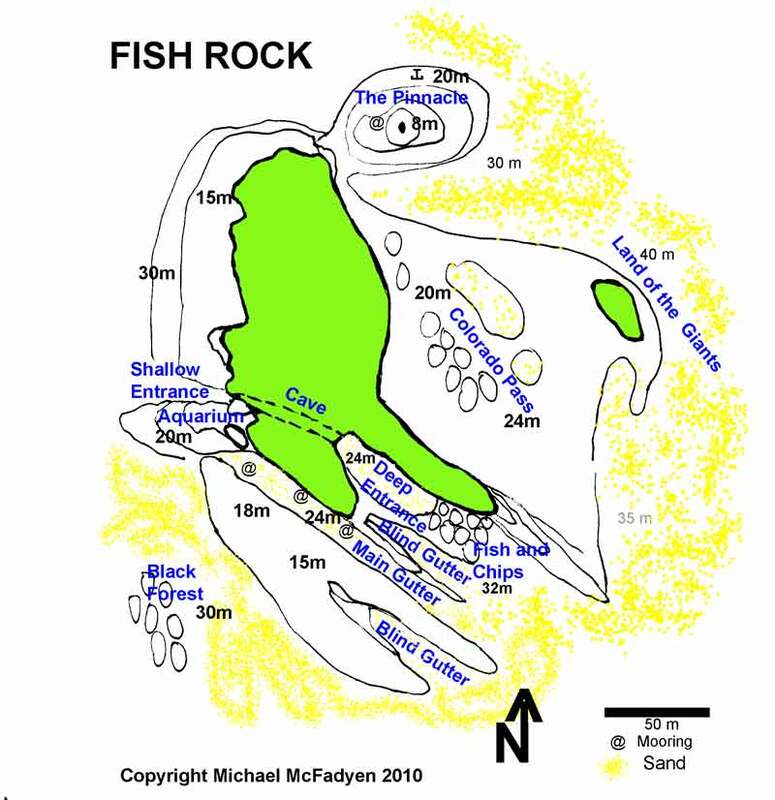 As well as Fish Rock Cave, there is The Pinnacle, Colorado Pass, Black Rock, Green Island, PS Agnes Irving and other dive lcoations. They are all excellent dives, each offering something a bit different. Off the south-eastern corner of Fish Rock there are the Shark Gutters. These ridges run at 45 degrees to the length of the island, towards the south-east. The top of the ridges are about seven metres deep closer to the island and drop to more than 24 metres away from the island. The bottom of the gutters are 24 to almost 30 metres deep. They run for a hundred metres or more away from the island and there are at least four or five gutters, although there may be more. Some are open ended gutters but some have a closed end (like a dead end street). 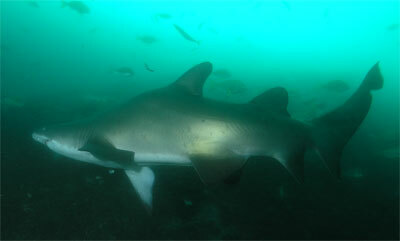 One of the very interesting dives, especially in Winter and Spring, is the Shark Gutters. 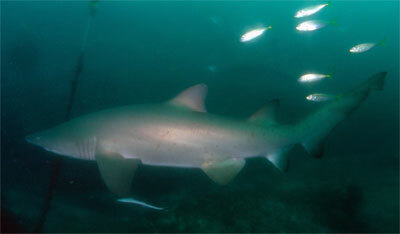 During this period, grey nurse sharks congregate in the gutters and cruise up and down very slowly. Although there are not the numbers of sharks that can be seen at Seal Rocks or North Solitary Island, you can get up to a dozen sharks here at any one time (although in July 2006 I saw over 30 in the Shark Gutters and nearby). I like to do this dive a number of times on a trip to SWR. Normally you would start at one of the moorings (you can do it as a "drift"). The moorings are in the main shark gutter. This is the longest gutter and runs right from the area just south of the shallow entrance to the cave, right across the southern end of Fishrock, out past the area south of the deep end of the cave. It keeps going and gets out to at least 35 metres. I have actually never been right out to the end, but the northern side wall peters out about here. There is another gutter north of this one. It runs from immediately south of the deep entrance to the south-east. North of here is a gutter that runs from the deep entrance of the cave. This is the most prominent in some ways as it has as walls at the start the island. This again runs out towards the south-west but runs out after about 30 metres. The end is composed of lots of large boulders, although with a little imagination you can make the gutter run right out to the eastern-most point of Fishrock (or further). South of the main gutter is a gutter that runs from near the middle-most moorings to the south-east. This gutter goes further than the main gutter. I have never seen the end. There may be another gutter south of here, but I do not think so. Anyway, from the mooring in the main gutter, follow the bottom of the gutter out deeper (to the south-east). 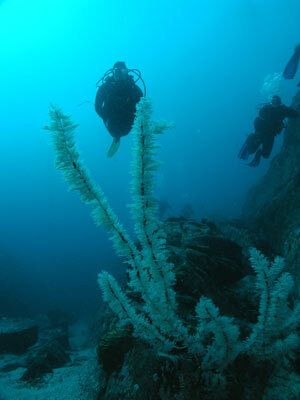 Along the way you can see black coral trees (white in colour by the way) and quite good sponge life. When you hit the end of the gutter, swim around to the north into the next and follow it back towards the island. You should see sharks in the main gutter and in the next one as you approach the island. On the way back you will probably have to ascend a bit onto the ridges due to lack of bottom time. Along here there are normally heaps of firefish in the small overhangs and protected areas. If time permits, you can examine the area to the north of the gutter end (outside the deep end of the cave) and be amazed by the prolific fishlife. I have even seen a long-snouted hawkfish on one of the black corals. This fish is normally only seen in Papua New Guinea from what I have read. Finish the dive by hugging the southern wall of the island or under the moorings. I fyou have spare time, cross over onto the ridge south of the main gutter. You can also explore this gutter if you can. 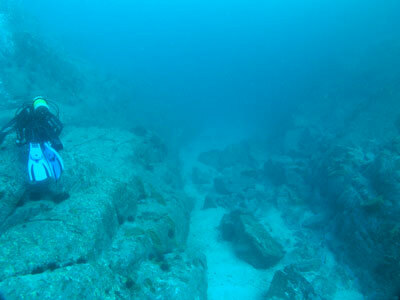 On a later dive, explore the main gutter and come back along the southern-most gutter. Especially look for firefish at the closed end of this gutter. 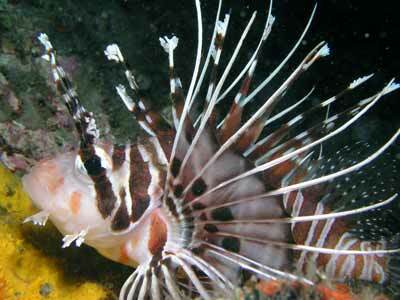 This is a very good dive, with visibility of up to 30 metres or more not being uncommon. A slight current can sometimes wrap around the island and be felt here. Be aware of this.